This entry is about the theory of the four future scenarios for a collaborative economy, firstly developed by Michel Bauwens. It is important to mention that Vasilis Kostakis and Michel Bauwens have just published a book, titled Network Society and Future Scenarios for a Collaborative Economy which discusses the four future scenarios in more detail. Keynote lecture at Art + Communication festival 2012. Lecture at Creativity 2013 (in Greek). Kostakis, V. & Bauwens M. (2014). Network Society and Future Scenarios for a Collaborative Economy. Basingstoke, UK: Palgrave Macmillan. We define as “netarchical capitalism” the first combination (upper-left) which matches centralized control of a distributed infrastructure with an orientation towards the accumulation of capital. Netarchical capital is that fraction of capital which enables and empowers cooperation and P2P dynamics, but through proprietary platforms that are under central control. While individuals will share through these platforms, they have no control, governance or ownership over the design and the protocol of these networks/platforms, which are proprietary. For example, think of Facebook or Google. Typically under conditions of netarchical capitalism, while sharers will directly create or share use value, the monetized exchange value will be realized by the owners of capital. While in the short term it is in the interest of shareholders or owners, this also creates a longer term value crisis for capital, since the value creators are not rewarded, and have no longer purchasing power to acquire the goods that are necessary for the functioning of the physical economy. The second combination, (bottom-left) called “distributed capitalism”, matches distributed control but with a remaining focus on capital accumulation. The development of the P2P currency Bitcoin and the Kickstarter crowdfunding platform are representative example of these developments. Under this model, P2P infrastructures are designed in such a way as to allow the autonomy and participation of many players, but the main focus rests on profit-making. In Bitcoin, all the participating computers can produce the currency, thereby disintermediating large centralized banks. However, the focal point remains on trading and exchange through a currency designed for scarcity, and thus must be obtained through competition. Furthermore, Kickstarter functions as a reverse market with prepaid investment. Under these conditions, any Commons is a byproduct or an afterthought of the system, and personal motivations are driven by exchange, trade and profit. Many P2P developments can be seen within this context, striving for a more inclusionary distributed and participative capitalism. Though they can be considered as part of, say, an anti-systemic entrepreneurialism directed against the monopolies and predatory intermediaries, they retain the focus on profit making. Distribution, here, not meant locally though, as the vision is one of a virtual economy, where small players can have a global compact, and create global aggregations of small players. Distributed control with a focus on the Commons is what we call the “resilient communities” (bottom-right). The focus here is most often on relocalization and the re-creation of local community. It is often based on an expectation for a future marked by severe shortages of energy and resources, or in any case increased scarcity of energy and resources, and takes the form of lifeboat strategies. Initiatives like the Degrowth movement or the Transition Towns, a grassroots network of communities, can be seen in that context. In extreme forms, they are simple lifeboat strategies, aimed at the survival of small communities in the context of generalized chaos. What marks such initiatives is arguably the abandonment of the ambition of scale while the feudalization of territorial integrity is considered mostly inevitable. Though global cooperation and web presence may exist, the focus remains on the local. Most often, political and social mobilization at scale is seen as not realistic, and doomed to failure. In the context of our profit-making versus Commons axis though, these projects are squarely aimed at generating community value. “Global Commons” approach (upper-right) is against the aforementioned focus on the local, focusing on the global Commons. Advocates and builders of this scenario argue that the Commons should be created for and fought for on a transnational global scale. Though production is distributed and therefore facilitated at the local level, the resulting micro-factories are considered as essentially networked on a global scale, profiting from the mutualized global cooperation both on the design of the product, and on the improvement of the common machinery. Any distributed enterprise is seen in the context of transnational phyles, i.e. alliances of ethical enterprises that operate in solidarity around particular knowledge Commons. In addition, political and social mobilization, on regional, national and transnational scale, is seen as part of the struggle for the transformation of institutions. Participating enterprises are vehicles for the commoners to sustain global Commons as well as their own livelihoods. This latter scenario does not take social regression as a given, and believes in sustainable abundance for the whole of humanity. These four scenarios differ in their vision for the prime focus of the accumulation of value, either for the benefit of global shareholders; for a network of small for-profit enterprises; for the local community; or for transnational Commons. Each scenario will have different effect on temporal and spatial organization and priorities. Global or local time, global or local space, will co-exist in different configurations according to which scenario will prevail. All of the four scenarios take the existing of P2P-enabling infrastructures as a given, and mutualize both immaterial and material resources to obtain economies of scope. Indeed, while economies of scale are advantageous in the context of temporal eras dominated by an abundance of resources and energy, i.e. producing more of a thing creates competitiveness; economies of scope become essential in periods of increased energy and resource scarcity, i.e. doing more with less. Open source is a mutualization of immaterial resources such as knowledge, which become operative for the whole of mankind, rather than fragmented and privatized through intellectual property. The mutualization of physical resources increases the efficiency of resource and energy use, combats the idleness of physical resources, and the waste that is inherent in fragmentation. The new P2P production modalities are global-local (or glocal). While they enable production at the local scale through micro-factories using distributed manufacturing technologies, both the knowledge work on the product and on the machinery can be global. As a general rule, one can say that the principle is this, “what is heavy is near, what is light is far”. Immaterial cooperation is maximized, but the global transportation of material good is minimized. In our four scenarios, what differentiates the strategies are first of all the aim of the cooperation, i.e. are they aimed at capital accumulation, or at improving the circulation of the Commons? And second, where is the focus of control? Is control distributed through the free self-allocation by the commoners, who can affect the governance and design of their infrastructures of cooperation? Or, is the design of the infrastructure in the hands of centralized privately owned platforms? In the first scenario of netarchical capitalism, control and governance is located within a single proprietary hierarchy, whereas in distributed capitalism, control is located in the network of participating for-profit entrepreneurs. 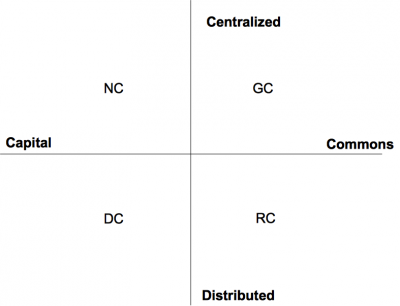 In the local community model, control is located in a particular geographical territory, and depends on the governance model of the initiating community. In the global-local Commons model, governance is located in the triarchical model of the community practicing the social self-allocation of resources, of the for-benefit associations that manage the physical infrastructures of cooperation (for example the multitude of Free/Libre Open Source Software Foundations); and of the entrepreneurial alliance that cooperates around the same Commons. In our latter model, it is essential that the Commons-orientation is guaranteed by new governance models of the participating entrepreneurs. For example in the case of the largely corporate Linux Commons, open source code Commons are clearly integrated in the processes of capital accumulation of the participating for-profit enterprises. A counter-model would require the creation of Commons-friendly, ethical enterprises, consisting of the commoners themselves, who also control their own governance and have ownership. Such enterprises would be legally structured so that theirs is an obligation to support the circulation of the Commons. We suggest a plural form of ownership which combines maker ownership (i.e. a revisiting of worker ownership for the P2P age), combined with user ownership, i.e. a recognition that users of networks co-create value; and eventually a return for the ethical funders that support the enterprise. This page was last modified on 8 September 2014, at 13:16.